After researching more than a hundred of models we concluded that Babyliss Pro Nano is the best hair straightener for most people’s hair. It heats up quick to the consistant temperature, and the temperature is adjustable and it will give the best hair straightening experience. Because of the variety of hair types and textures, an hair straightening flat iron that works great on someone’s hair may not be a perfect choice for your hair. That said, hair type is just one criteria of choosing a tool for your hair, other factors like build quality, efficiency, ergonomics, and types of plates, heating technologies would be highly considered. Nevertheless, knowing your hair is still the most important part before deciding which hair straightener you’re going to buy. It should take a huge a mount of time for you to search for best hair’s friend. To help you save your time and easily pick a right tool among hundreds of tools out there, I’ve rounded up a list of best hair straightening flat irons considering your hair length, texture, and thickness. Have you ever struggled with the heat setting from your previous hair straightener? In which, you couldn’t set the heat that work brilliantly to your hair. Not enough heat means you have to go over again a single hair strand for perfectly straightening, but too much heat may severely damage hair. Either way doesn’t work out. Then the Babyliss Pro Nano comes in, the nano titanium plates are built to get exactly to the temperature your hair needs. It is rated with highest reviews from buyers for fast heating up rate, ease of use, great results. If you have thick, long hair it’d be better to have hair straighteners with larger plates to save time. Who is it for? The Babyliss Pro Nano is available in two size 1 inch and 1 ½ inch, it is up to your hair to get the larger size, as a rule of thump the thicker and longer hair, the larger plate. The setting of Babyliss Pro Nano is varied in 50 levels-heat settings, my recommendation for most hair is keeping it below 300F. 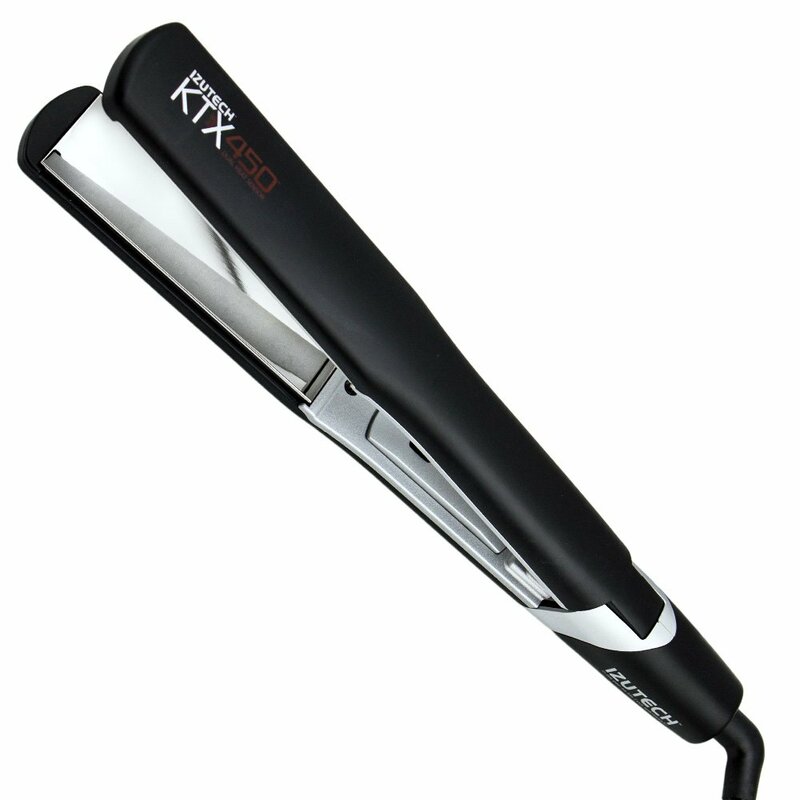 The IZUTECH KTX450 is a well-built and designed flat iron. It is comfortable to hold, and easy to handle with Swivel cord. It remains as our most favorite flat iron for years. This flat iron is ideal for those who have medium hair—average of all things, for example hair is not very thick or curl with shoulder length. One says this tool brings about the best results among other tools she’ve tried. Most styling tools recommended in this article, as advertised they can get as high as 450F. Is this temperature neccessarily set for your hair. My answer is NO, for any hair types, experts suggest you shouldn’t adjust your tool no more than 300F. High heat setting may take effect and work faster on hair, but your hair is at higher risk than straightened at lower temperature. Unlike variable or fixed hair straightener, which have dial to change the settings and only can get to a certain range of temperature, a digital flat iron let you choose exactly the temperature you want by pressing a button (-+). The LED screen will not only display the temperature you have chose, but the colors that matched to a range of heating. So you virtually know whether you’re in a safe zone. It features hand touch tech, which will reduce heating when not in use and automatically shut off after 60 minutes. Once turned on, the EPS Black Diamond will get to the desired temperature you set within seconds. The thick, durable, fully coated ceramic plates go through your hair with ease, for any directions. Runs very nice through your hair with ease. Flat iron also allows you to make beach waves. The included case is heat-resistant, so you can put the flat iron right after use. Some cheap products gives standard work. 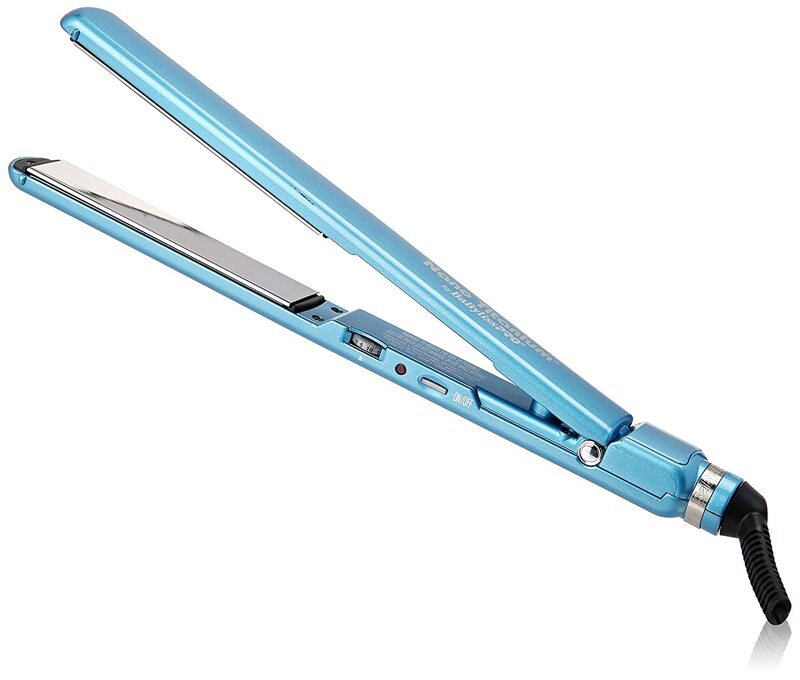 They may not be durable and built with high quality, but they actually straighten your hair for straight, shiny, silky results. Note that the plates of those hair straighteners are easily to wear out, break or the thin coat degrade, causing the exposure of the metal inside the plate, if you see this stop using them. Cut the cord, a wirless or cordless hair straightener give you freedom to style your hair on the go. They use either Butan gas or battery to power the heating, so don’t expect them will work as wired model. They provide less heat, so are less effective. I would recommend the Cornair Cordless with thermacell butane gas or the CHI Escape with battery. Stay away from this type of hair straightener if you have thick, and very curly hair. Otherwise, it is fine for those who have thin hair or you just need style some hair strands. If you look for a flat iron hair straightener that you can recharge and use in car. The best option is CHI Smart Voyager 1″, it offers the cigarette lighter charging adapter and is designed for light user only, if you just need a small fix on your hair strands. Cordless hair straightener also has short battery, normally they last from 20 to 30 minutes, depending on how high the temperature you set. If you go camping, this tool will be helpful on your trip. Supposed you have long, curly hair, guess what should you pick? I found it is way more effective than non-vibration flat iron, quick pass over a 2-inch piece of hair, it really works. If you have medium-length to longer hair. For this type of hair, you should pick the adjustable heat setting hair straightener with 1 to 1 1/2 inch plates. And choose the lowest setting first because this type of hair is easy to break, I prefer ceramic plates. Hair straightener for african american hair: this type of hair is unique in appearance and structure, but it is easy to damage. If use a wrong hair tool this type of hair can be thinner or lost due to heating. And it’d be better to usea heat protectant product before straightening. If you have color-treated hair, go for adjustable one and choose the lower heat setting first you will figure out it is easy to style as your hair went through color treated process their internals are more exposed. Certainly I believe one of the two Babyliss or the IZUTECH will satisfy nearly anyone who first time look to buy an hair straightening flat iron. Before going through details about reviews and features, kinds of plates. Here are some facts, which will let you know which hair straightener is best for your hair. Steam hair straightener: steam created from water stored a tank. The tank locates on the top of the tool. How to fill the water tank of steam hair straightener? Not ony do they work nicely on 3c/4a thin type hair but african american hair. You can use oil Infuser with this hair tool for a perfect silky smooth. When working with the roots of your hair, be careful, because it releases hot stream that is hot. A trick is that once you get close to the roots, quick pass and slowly slide to the rest of your hair. Here are some key facts when most people look to buy their first hair straightener flat iron would like to know. First, in product description they could see Nano, Titanium, Ceramic, and so on. Those words come from great technologies, which to give users best experience possible while styling their cut look. Here I briefly explain some of them. Nano: This term refers to the size of particles that coats the surface of the plates. When the products are listed with “nano” term, its plates often have homogenous surface and conducts heat better. But that’s just a matter of science, if you really know how nano products have advantages over non-nano products. Titanium: This is metal, so it conducts heat faster than other type of material. Hair straightener made with titanium plates are also supposed to be more durable and lighter. They release more heat, and common practice that people wear heat-resistant gloves when preforming hair straightening. Ceramic: A kind of material, provided with smooth surface and no-friction they are the best choice for medium hair. For hair that is thick, coarse, curly people call it “stubborn hair”. They should be treated with high heat setting that does straighteing by just 2 or maximum 3 passes. You can choose any type of material for plates, ceramic, titanium or tourmaline as long as they can have the temperature range in 380-430 degree celcius. One more thing, it also depends on your hair length to choose the plate size. For the best practice, if your hair is above shoulder length the plate size can ben 1 to 1 1/2 inch. If it is longer, larger plates will work better. If you have medium hair, the best temperature range that ideally work for this hair is from 360 to 380. 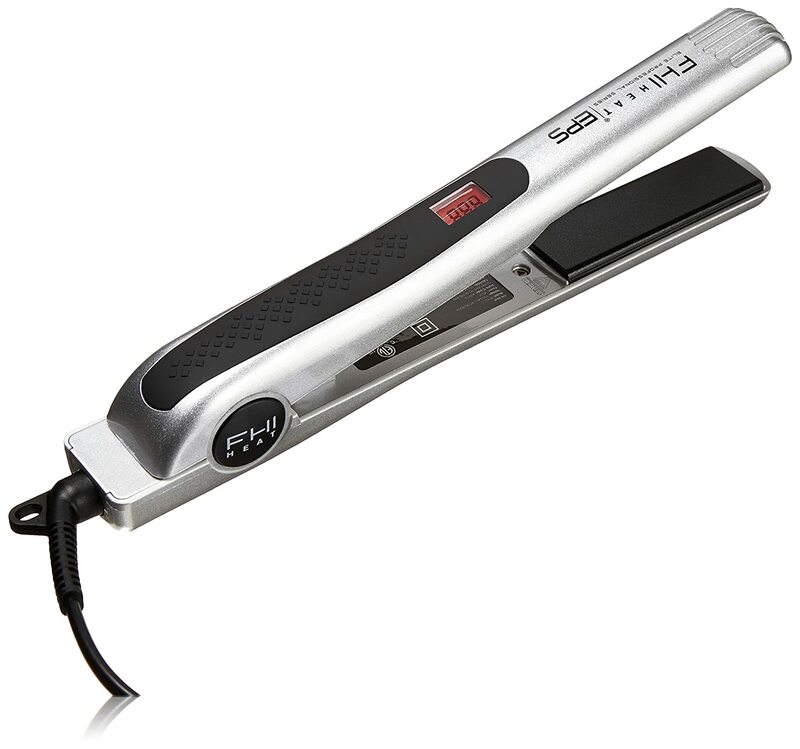 You can go for CHi original pro flat iron that has a fixed temperature around 370. Lastly, for fine, thin hair, you won’t go for a fixed flat iron, instead a adjustable temperature control is more preferred, and keep it below 360. If your hair is more like easy to break or very thin, set the heat belower. Hair straightener is apparently a great tool for straightening hair, eliminate frizz and tangle. But not all people know how to use it effectively, check out our my post about how to straightener hair perfectly to prepare your hair before styling. From my experience, the first impression about the hair straightener is when you hold it on your hand. Does it solid and easiy for you to clip, you don’t even have to press to much. The second is gioing to be how the plate slide on your hair after you plug it in, switch on and wait seconds. The lastly are the effective? It’s true that you may pass the flat iron 2 times or more for perfectly straight results, and the more it passes the more your hair is exposed to damaging. Taken all these facts into accounts above are the best hair straightener you could find. If the product advertises your hairstyle will last longer after straightening, being considered, it is not for everyone, because it depends largely on your hair structure and products you use for hold. The lasting I want to mention is how do you like to adjust the temperature of your hair tool. We live in a digital world, so products seem to be digitalized that you can press buttons and there is a small screen indicate the real temperature. Regular tools have a dial, and you change the heating by switching the dial for certain temperature range, and you don’t really know exactly what the temp of plates is. What else I would need after I ordered a hair straightener? And the last thing if you think holding a flat iron is tough because of heat released from the plate. You would need to wear a glove if they are not included in your new hair straightener, it’d be better to get a pair. I agree Carmella, mine is the Salon Series hair straightener but I use it to curl my short hair, so fast & easy.